Period of the promotion: from February 2, 2015 through June 30, 2016 . The promotion is efficient for Classic and Market Pro accounts that are not linked to “Double deposit” and “Fresh Rebate 50%” promotions. Connect one of your trading accounts to the bonus plan in the personal area. Further you cannot change the selected account. Make a deposit and begin trading. 25% on each deposit of the amount from 200 USD /180 EUR. If in the result of conversion, paying commission or other costs the amount is less than the required amount, the bonus shall not be provided. If net arrival of the funds (all top-ups minus withdrawals) from the time of start of the promotion to the moment of deposit is negative, the bonus shall not be provided. The bonus is credited to “Credit” column, is purposed to maintain account under drawdown and increase of trading volume. If from the moment of bonus credit trading volume of client is more than 35% of bonus amount accounted in USD, current active bonus amount is transferred into the “Balance” and becomes available for withdrawal. The sum of an active balance on account is the amount of bonuses received one by one without a break for withdrawal or transfer into balance. To transfer profit into balance, you need to fully comply with the clause and contact support. Partial transfer into balance is not allowed. Example: you deposited 200 USD and received a bonus 50 USD and trade. One more deposit is 1000 USD and bonus is 350 USD, resulting in current active bonus as of 400 USD. 400 USD * 35% = 140 closed lots is the clause you need to satisfy to transfer bonus into “Balance”. An already deducted bonus cannot be transferred into balance and the sum of active current bonus is newly accounted starting from new deposits made after deduction. 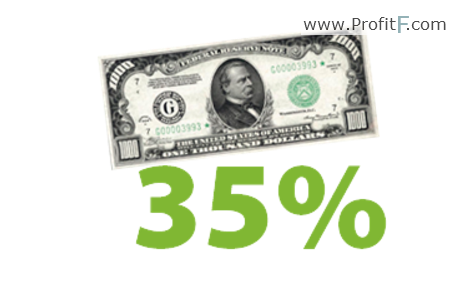 You pay 35% of withdrawal fee from the amount of withdrawal. The company reserves the right to retain up to 35% of reward for the clients attracted by partners and participating in this promotion.